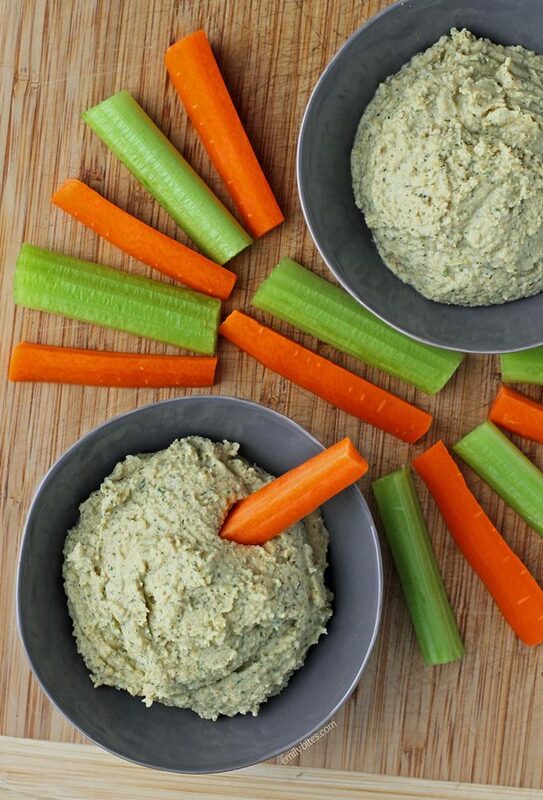 This Ranch Hummus recipe combines the flavors of two veggie dip favorites into one! Instead of the more traditional tahini and oil, this ranch hummus is smoothed out with Greek yogurt and seasoned with the tasty herbs and spices used in ranch dressing or dip. 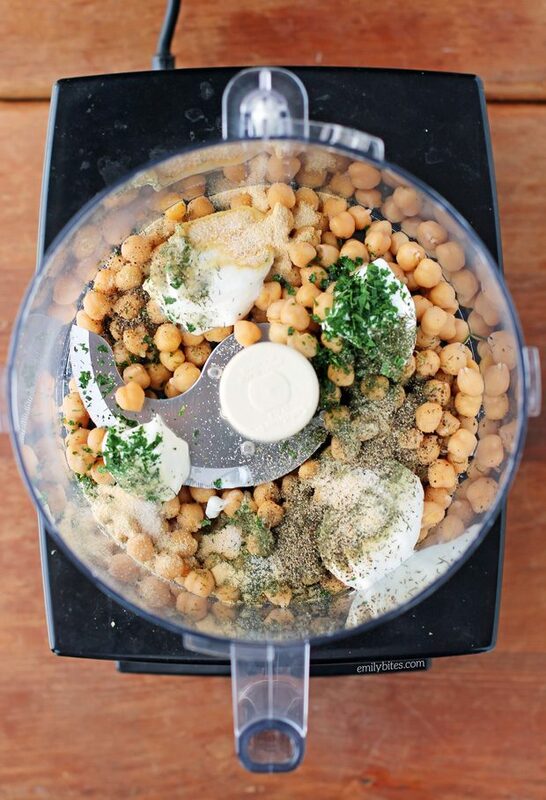 Making your own hummus really couldn’t be easier, you just combine ingredients in a food processor and turn it on! This ranch version is perfect served with veggies for dipping and a serving is only 73 calories or ZERO Freestyle SmartPoints on Weight Watchers. That’s right, zero! If you’re on a hummus kick, you should also try my Buffalo Wing Hummus – it’s one of my favorites! Either of these recipes are great to make for snacks, to use as a spread on sandwiches or wraps or to mix into a salad. Hummus is also a super easy, crowd-pleasing dish to make for parties or bring to a get-together since it doesn’t need to be warmed. Looking for some tasty recipes to make using hummus? Check out my Hummus Veggie Tots, Garlic Herb Veggie Sandwich, Hummus Deviled Eggs, Fiesta Hummus, Greek Snack Flats, Hummus Chicken Salad, Pizza Burger Sliders, Hummus and Feta Omelet, Greek Layer Dip, Mediterranean Wonton Cupcakes, Mediterranean Pasta in a Creamy Feta Sauce or Mediterranean Chicken Wraps! Optional: I like to add some lemon juice sometimes too if I have a lemon on hand, because I love lemon in hummus! Place all the ingredients in your food processor and turn it on! Process for about 2 minutes or until smooth. You may want to stop it halfway through and scrape the sides of the processor bowl down with a spatula just to make sure everything gets processed smoothly. Made this today and included the lemon juice. I loved it! It was a nice change! Thanks for the recipe! Definitely need to try this, thank you! Made this for a family party Saturday was delicious!! Everyone loved it!! I did use a squeeze or two of lemon juice. I’m not a huge hummus fan and I loved it – will definitely make it again very soon. Thanks for another fantastic recipe!! Great recipe! Loved it w the lemon. Do you know how long it will last in the fridge? This recipe is really great!! So nice to have a tasty thick zero sp dip/spread! I put it on toast, sandwiches and dipped veggies in it. Best hummus I have ever had – and so EASY. Thanks for the recipe! I’m excited to try it, I’m wondering if you have any tips on how best to store it and how long it will last in the fridge? Thanks!